I delighted to announce that I am one of the authors involved in the shared world Steampunk anthology Angels and Automatons, to be published by Steam Press. The stories of Angels and Automatons will be set in the fictional goldmining town of Angelston in the West Coast of New Zealand in the 1860's. It's the brain-child* of Stephen Minchin, editor extraordinaire and founder of Steam Press so it promises to be a superb collection for steampunk enthusiasts and those who want a sample of the genre. You can give your support to this project on Kickstarter. There are some great rewards available and it should be a fantastic anthology. 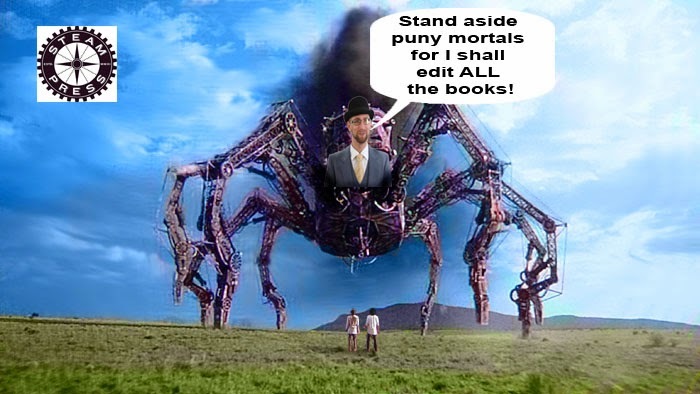 * I say "brain-child", but rumour has it the real progeny of his fevered imagination is a giant steam-powered robotic spider with which he believes he will be able to stimulataneously assess and edit up to seven manuscripts at a time whilst still retaining one free mechanical limb for drinking coffee purposes.